Complete the Online Booking form, accepting on behalf of all parties the terms of these booking conditions and pay the total Tour fare per person. No contract shall exist between the company and the client until the prescribed payment has been paid and the clients booking has been confirmed by the Company. The payment will be refundable should the company not be able to accommodate the client on the requested tour. Be advised that we can collect you at any Guetshouse in Stellenbosch town area or at the Tourism Information office at 36 Market Street, Stellenbosch. 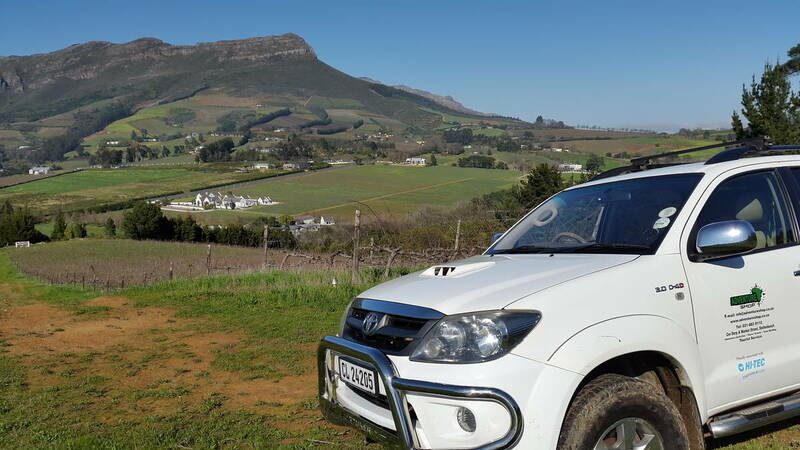 We can collect outside Stellenbosch area at an additional cost when available. Please supply us with your pick up location in form when making booking. Please be ready for pick up from 15 minutes before you chosen departure time. The full payment of the tour fare due by the client to the Company, must be paid on booking, otherwise the Company may treat the booking as cancelled by the client. Late applications may however join the tour on an availability basis. Although every effort is made to adhere to itineraries as advertised, the company reserves the right to occasionally change routes and accommodation as brought about by changing conditions. When a major change becomes necessary, notification of such alterations will be sent to the client’s agent or to the client’s last known addresses soon as the company becomes aware. The company reserves the right to alter an itinerary after a departure if it is in the client’s interest to do so. The company will not be held responsible for any compensation to the client if the Company have to cancel or in a way change the tour due to force majeure, namely war, riot, civil strife, industrial dispute, terrorist activity, natural or nuclear disaster, fire, adverse weather conditions or other external circumstance beyond the Company’s control. The decision of the driver guide of the Company will be final in all matters likely to endanger the safety of the clients of the group. The Company shall not be held responsible for or liable to any client who commits an illegal or unlawful act in the country visited. The client may be excluded from the tour without any refund of the tour fare. If the Company considers the client as unsuitable for a tour, it may in its absolute discretion, cancel such a client's booking and cease to carry the client further if that client causes inconvenience or annoyance to other passengers. No employee or representative of the Company has the right to alter, vary or waive the right of these conditions, nor to undertake any liability whatsoever on behalf of the Company, unless such be in writing and signed by the director of the Company. The Client acknowledges being aware of the proposed itinerary and hereby confirms that he or she is medically fit, in good health, and is able to embark upon the tour. Any client with a pre-existing medical condition or illness must declare the true nature of such condition at the time of the booking and make arrangements for the provision of any drugs or other cause of treatment that may be required during the tour. Such a client would be required to provide a medical statement from a GP to confirm that they are fit to travel. The Company and its representatives will treat all information in the strictest confidence. The Client must take all necessary inoculations as are recommended in relation to the country to be visited. For some countries a valid Certificate of vaccination is required. The Company does not accept responsibility whatsoever for any client refused entry to any country due to incorrect or incomplete health documents or vaccinations. All baggage and personal affects are at all times at the client’s own risk and the Company cannot accept liability for any loss or damage to baggage or personal effects. It is the responsibility of the Client to be in possession of a valid passport, visa requirements, vaccinations and other medical certificates and all other travel documents and or payments where applicable. The Company does not accept any responsibility in changes in regulations for visas or any particular requirements for visas. The Company cannot be held responsible for the failure of the Client to obtain the necessary travel documents. Should the client be refused entry to any country due to incorrect or incomplete documentation, the Company is not liable for any cost of such delays or repatriation costs for the Client. Travel and cancellation insurance is mandatory for all clients. Before a client commences a tour, he or she must arrange his or her own insurance with a reputable insurer, with protection for the full duration of the tour to cover injury, medical expenses, loss of luggage, and the expenses associated with the cancellation curtailment of a tour. The Company shall not refund the client in the case of illness, death or loss of body parts. The Client must make sure of fully covered travel and medical insurance. Client’s bookings are accepted on the understanding that they appreciated the possible risks inherent in Adventure Travel and that they undertake the tours and expeditions at their own risk. While every precaution is taken to enhance the safety of the client participating on the tour, the Company can not be held responsible for death, or any injury or loss that might be sustained on tour. The Client and his / her depends, heirs, executors, administrators AR assigns, hereby indemnifies and hold blameless the Company, its members, employees, representatives, organizers, helpers and agents from any claims of whatsoever nature and from any liability or delay, loss, damage, injury, illness or death arising from any cause whatsoever out of events related to or occurring during the tour. The Company reserves the right to change the prices due to unforeseen increases or exchange rates fluctuations to which it may be subjected. The Company also reserves the right to change any of the facilities or vehicles described in the brochure, without becoming liable for compensation or refund. The Company may take films or and photographs of our clients while on any tour, and reserves the right to publish, or use the material in advertising, without obtaining the consent or the payment to the client. This contract shall be interpreted under the laws of South Africa. In the event of any dispute between the parties hereto this version in English shall be the basis of the contract. If any part, term or provision of this contract is held to be illegal or unenforceable, it shall not affect the validity or enforce ability of the remainder of the contract. Furthermore, if any covenants are held illegal or unforeseeable by virtue of its scale, extent or duration, it shall remain valid and enforceable in such reduced scale, extent or duration as any count may decide as being the maximum scale, extent or duration permissible In the event of any dispute between the parties hereto this version in English shall be the basis of the contract. Online Payment may be made via Visa and MasterCard. Payment can also be made via Electronic Transfer or Cash on arrival. Card transactions will be acquired for Adventure shop via PayGate (Pty) Ltd who are the approved payment gateway for all South African Acquiring Banks. PayGate uses the strictest form of encryption, namely Secure Socket Layer 3 (SSL3) and no Card details are stored on the website. Users may go to www.paygate.co.za to view their security certificate and security policy. Customer details will be stored by Adventure shop separately from card details which are entered by the client on PayGate’s secure site. For more detail on PayGate refer to www.paygate.co.za.